Pacifica is the seventh world exclusively appearing in the Game Boy Advance remake of Donkey Kong Country 3: Dixie Kong's Double Trouble!. It is a water-themed world like Cotton-Top Cove, and is located in the northwestern lake of the Northern Kremisphere, only reachable by using the Turbo Ski. The world boss is Barbos, who was originally fought at Razor Ridge. According to the instruction manual, the entrance to Pacifica is located underneath a lake, although the area itself isn't entirely flooded. Pacifica itself consists mainly of two lakes, the southern one is the only location of green Lurchins. The northern lake is prone to rough weather. The Kremlings have apparently built more industrial zones outside of Mekanos, as two pipelines can be found throughout Pacifica. These pipelines are filled with water, and serve as habitats to many aquatic creatures. 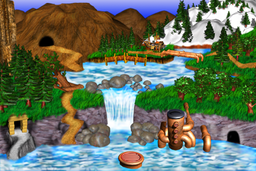 One of the levels features large trees submerged into the northern lake, which the Kongs must swim through. Once a resident of Lake Orangatanga, the Brothers Bear Barnacle has moved into a washed-up ship and claimed it his home. The area's Banana Bird Cave, titled "Whirlpool Wreck", is located directly north of Barbos's domain. This page was last edited on February 19, 2019, at 08:40.